Last summer I purchased a set of two lanterns. One of the lanterns arrived with the glass broken. 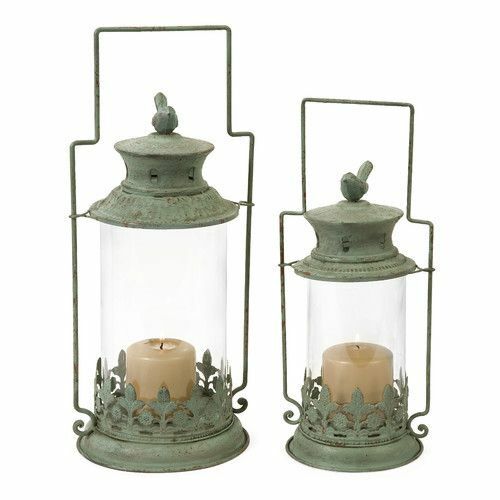 The company I purchased them from (Wayfair) was great and immediately replaced the lantern and didn’t want the broken one back. 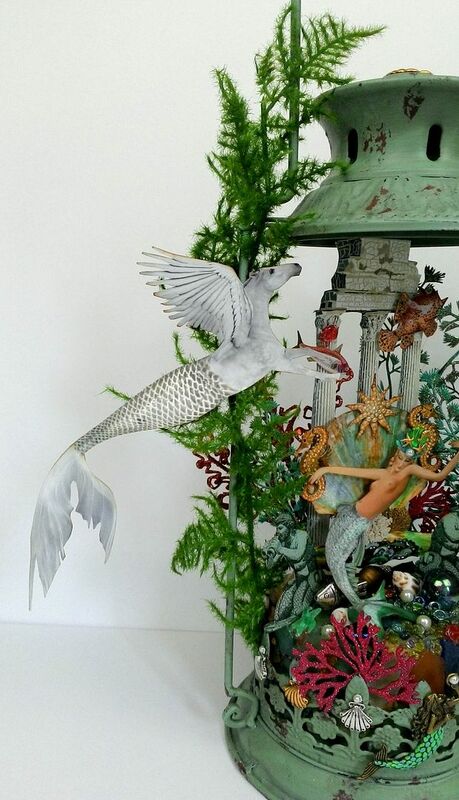 I hated to throw it away so I decided to create a mermaid scene. 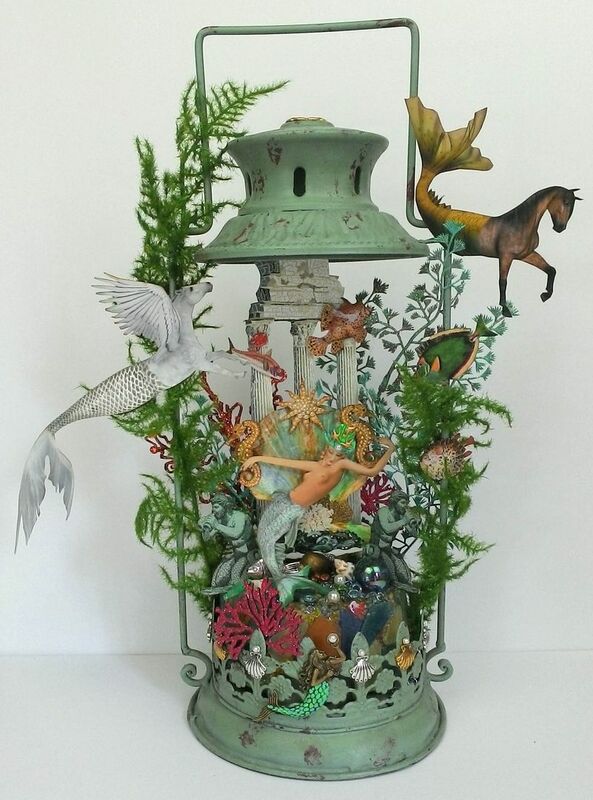 The sides of the lantern were great for adding aquatic plants and creating the illusion that the of seahorses and other creatures are swimming. 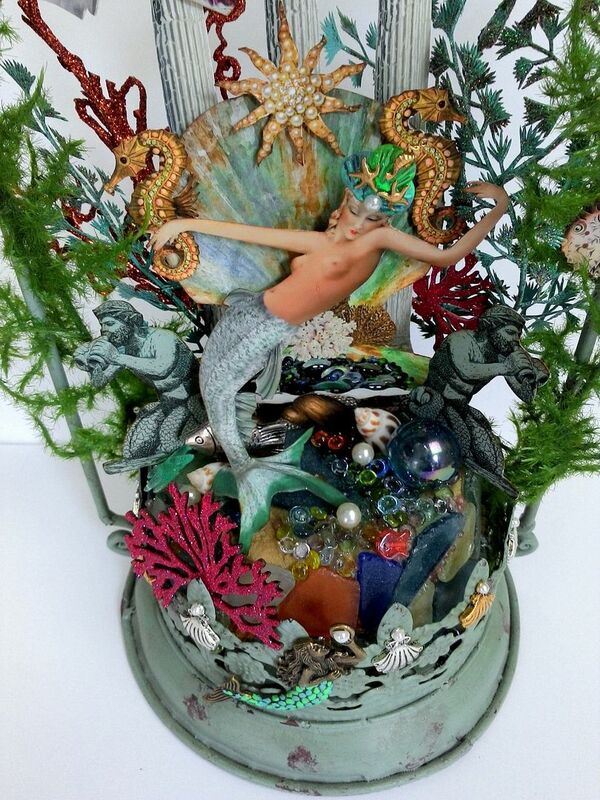 The columns stand in the center of the piece with the mermaid queen sitting on her shell throne. 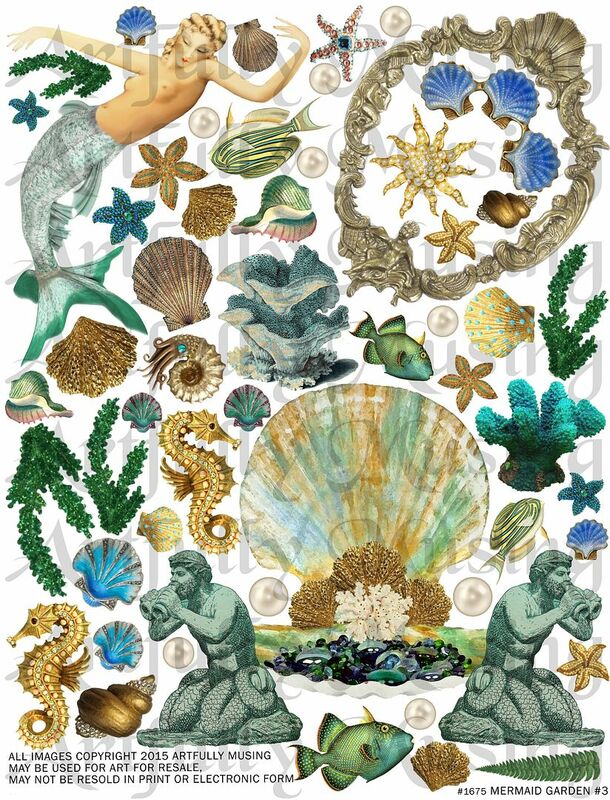 It provides a place to attach the thrown image, sea creatures and aquatic plants. 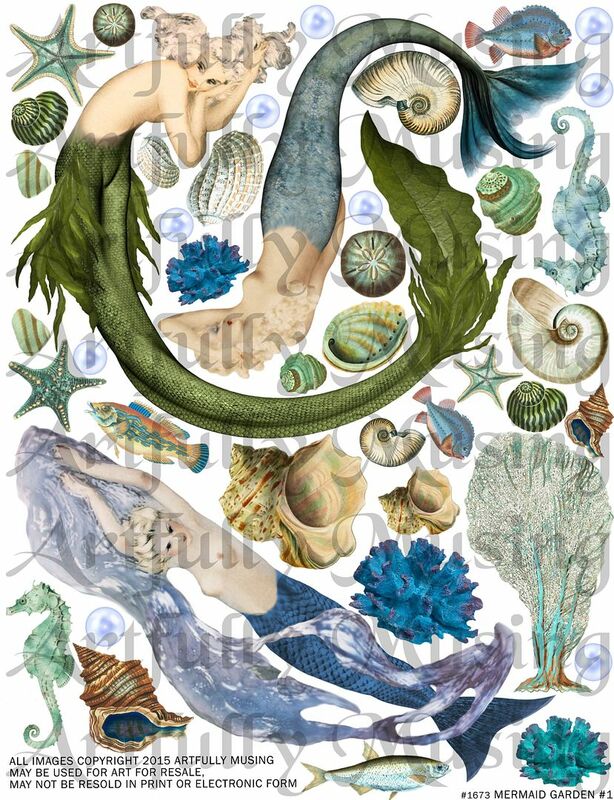 All the images you see come from my Mermaid Garden Collage Sheet series. 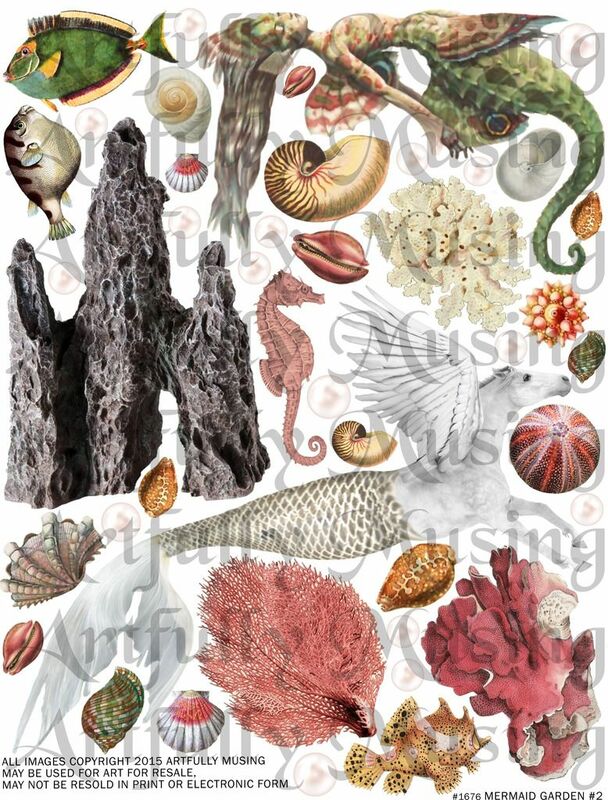 These sheets are packed with all kinds of images to create a magical underwater world. 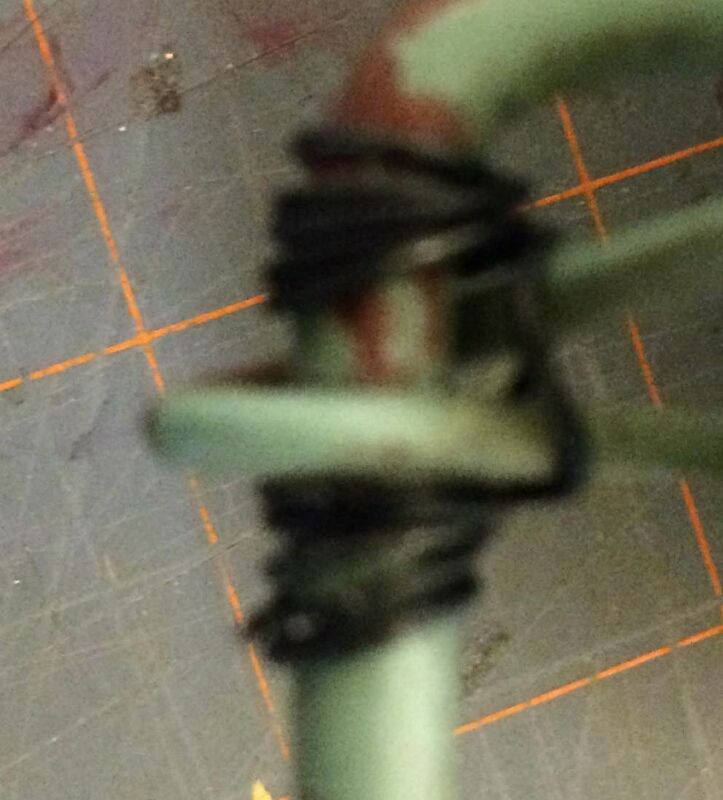 The first thing I did was to wrap the wire around the top piece to keep it from sliding down. Without the glass, there is nothing to hold the top piece in place. I painted the wire to blend in with the lantern. Next, I cut the bottom off of a Styrofoam cone to create a base. I applied glue to the Styrofoam and coated it in the sand. 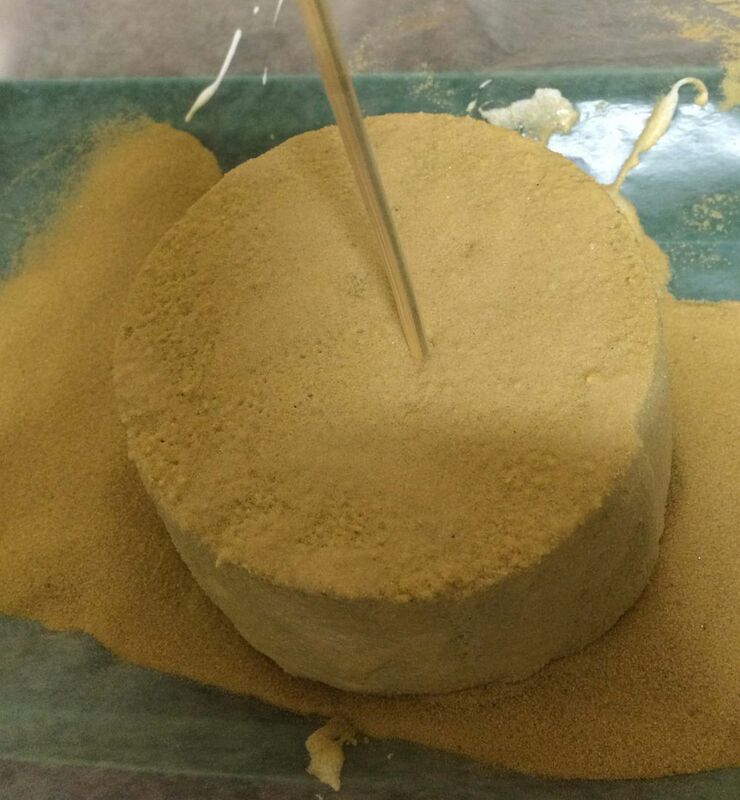 I inserted a wooden skewer in the Styrofoam so I could lift it to sprinkle the sand on the sides. 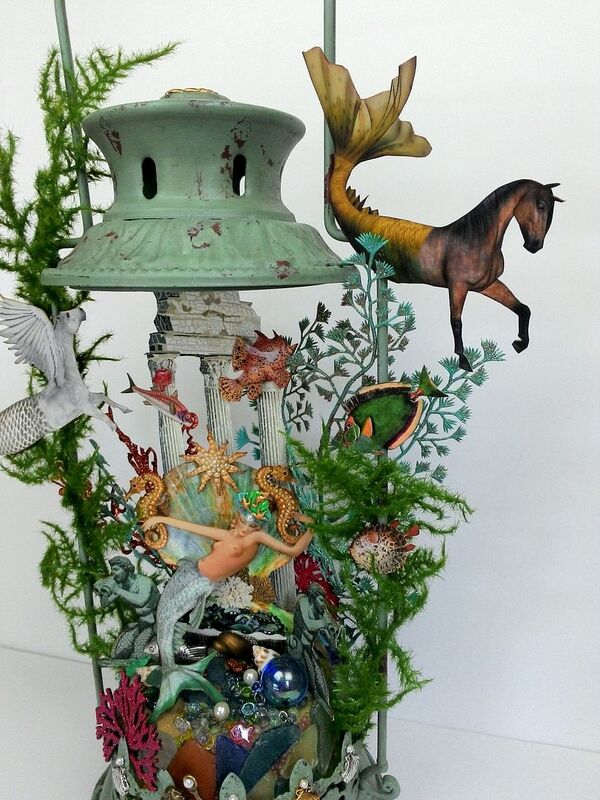 To make the columns that are the centerpiece of the scene stand up, I added wooden skewers to the back side. The bottom of the skewers sticks into the Styrofoam. 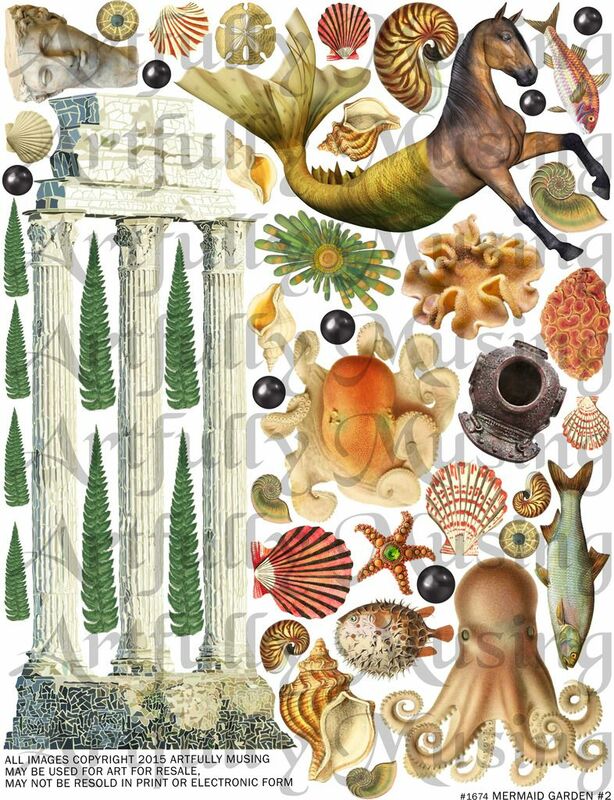 The column image comes from the mermaid garden collage sheet and is backed with thick printed cardstock. In addition to the Asparagus Fern Garland, I found some cheap plastic greenery at the craft store which I painted and glittered. 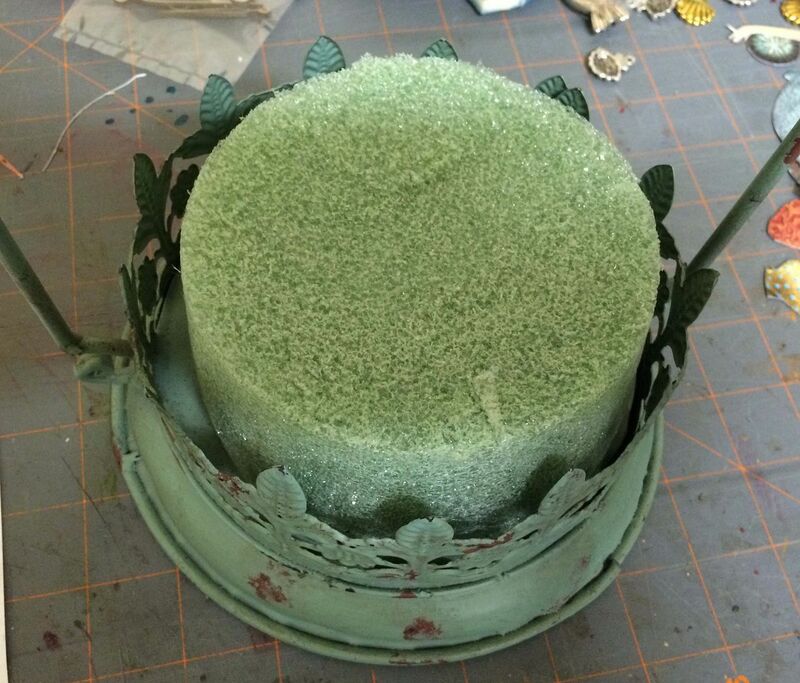 I glued various colors of sea glass around the Styrofoam base. 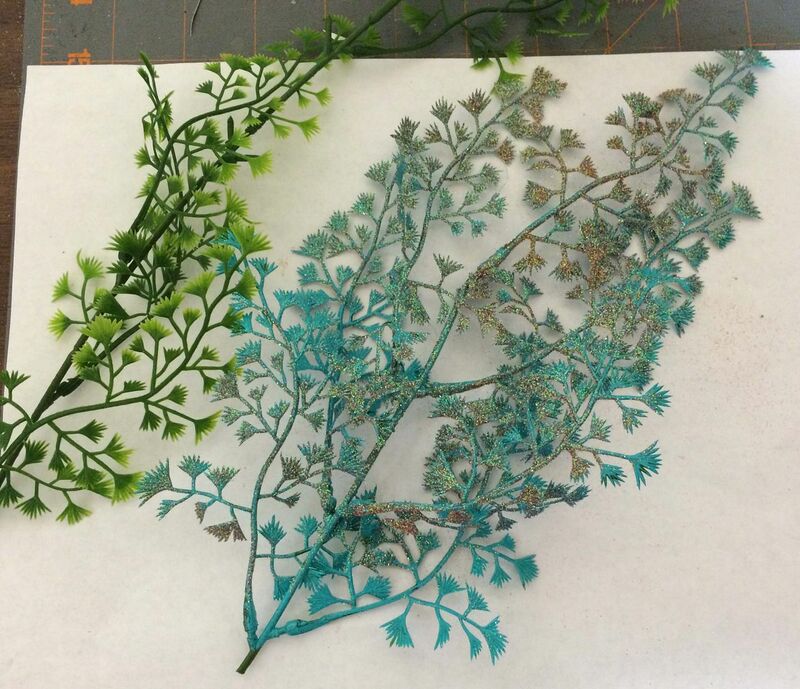 Tip: you can use alcohol ink to change the color of the glass or to add more colors. I used lots of pebbles and marbles from my stash on the top of the Styrofoam base. 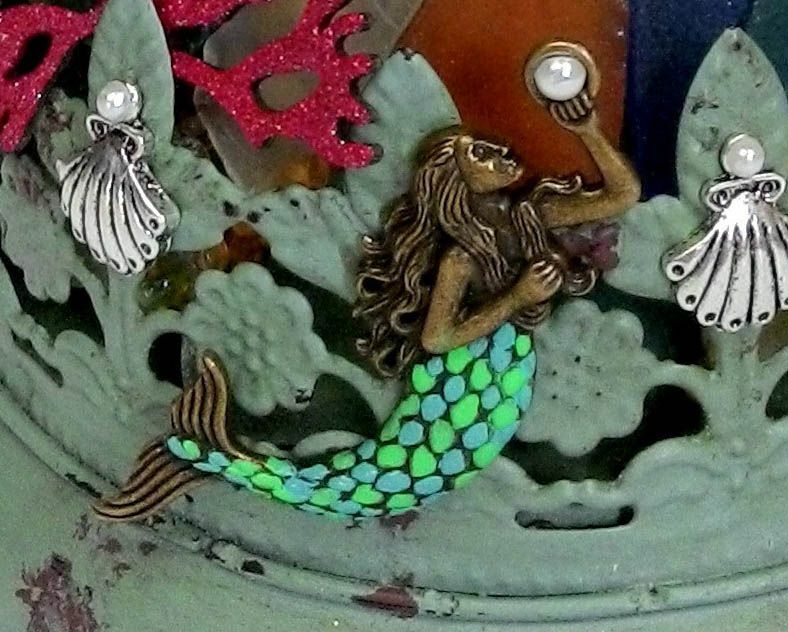 On the base of the lantern, I added a mermaid pendant charm painted with Patina Paints. I can’t believe it is already February! 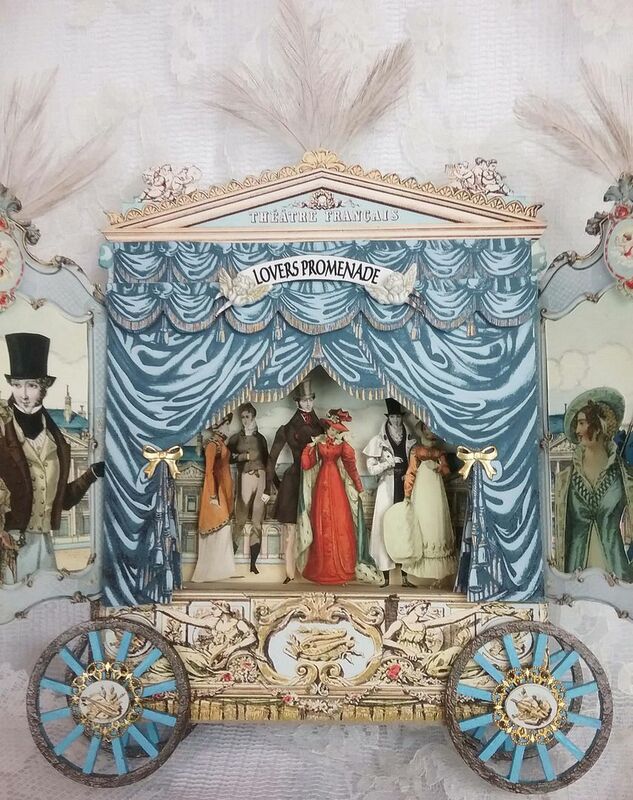 With February being the month of love, I have another romantic project to share with you; the traveling Theatre Francais presents “Lovers Promenade”. It’s the final scene in which after many pitfalls, all the lovers are finally united (aka a happy ending). 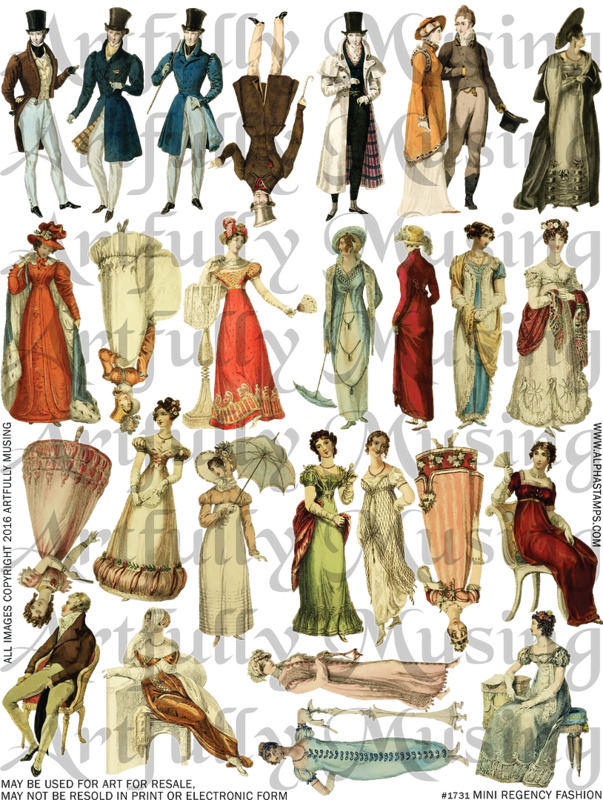 This collage sheet is filled with 26 miniature men and women wearing Regency period fashions (my favorite) and are approximately 2 ½” tall. 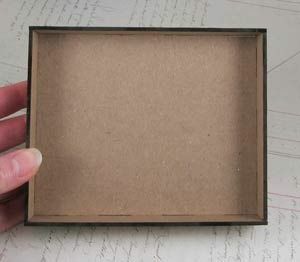 The images are sized to fit the theater shadowboxes carried by Alpha Stamps and are great for other small art projects. 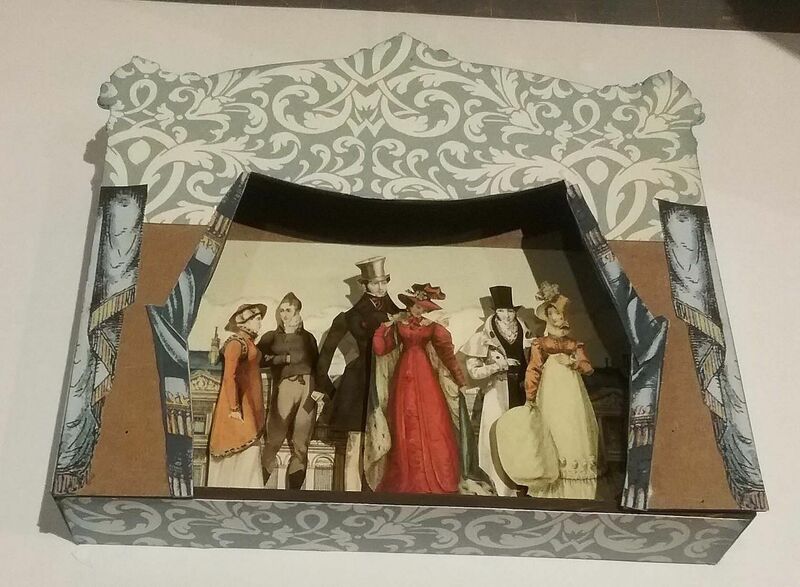 I assembled this theatre using a chipboard kit, collage sheet images and chipboard wheels. On either side of the stage are the doors (faux) so that the theater can be secured and moved to the next town for another performance. 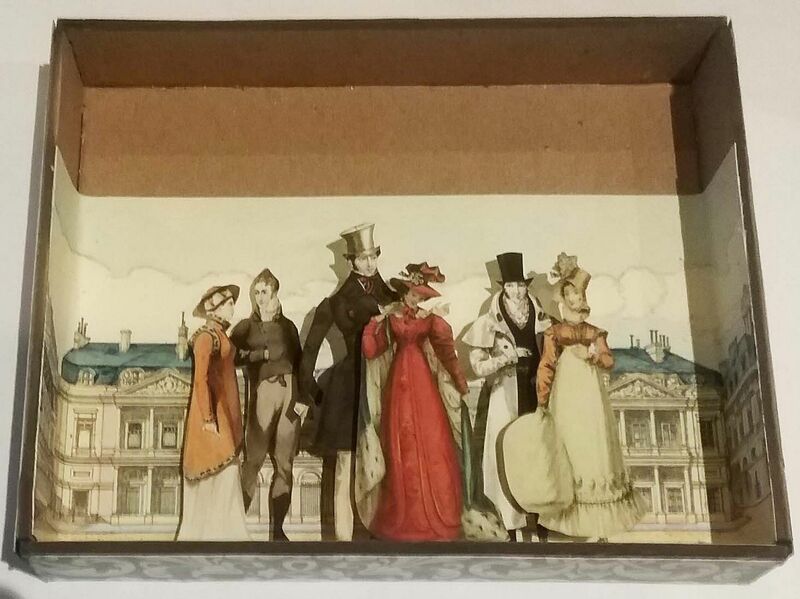 I started with a chipboard shadowbox kit which includes 5 pieces that lock together with tabs and notches. 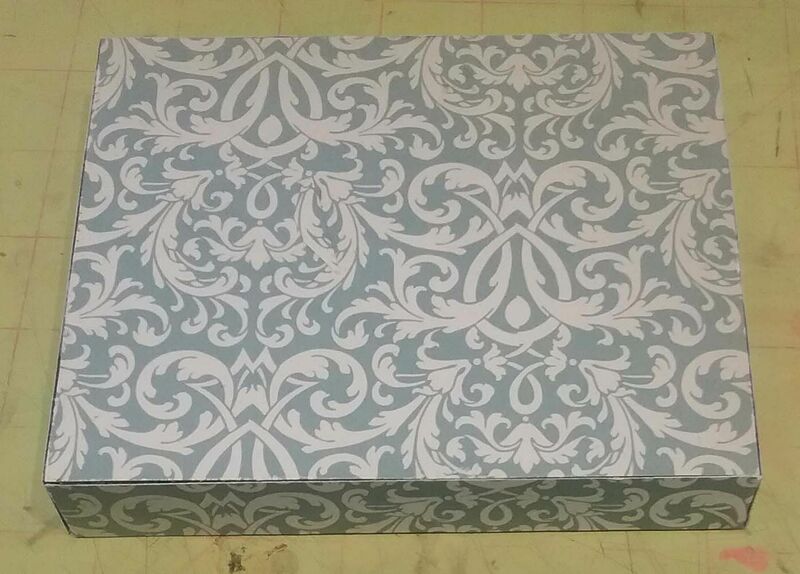 After gluing the pieces together, I used decorative paper to cover the outside of the shadowbox. 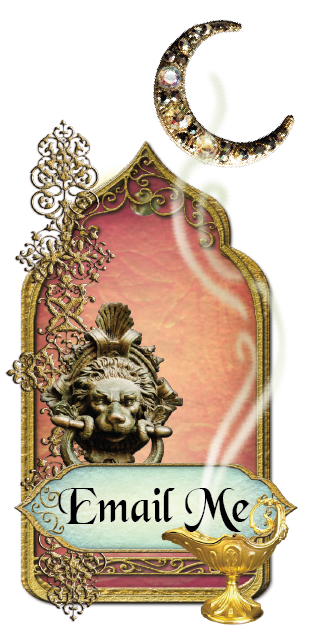 Next, on the inside, I added the background scenery from the French Fairies Shadowbox Façade collage sheet. 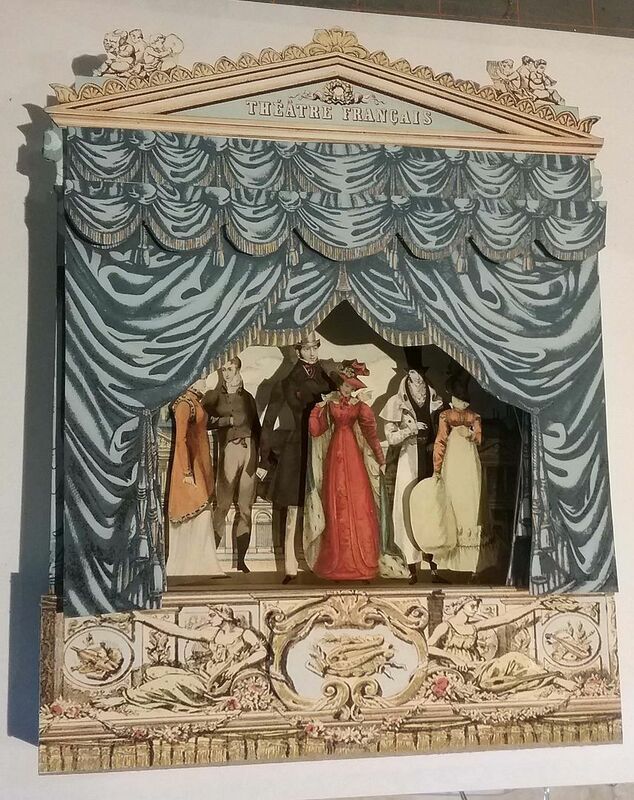 You don't need to add anything else to cover the inside of the shadowbox as you won’t see it when the curtains are attached. 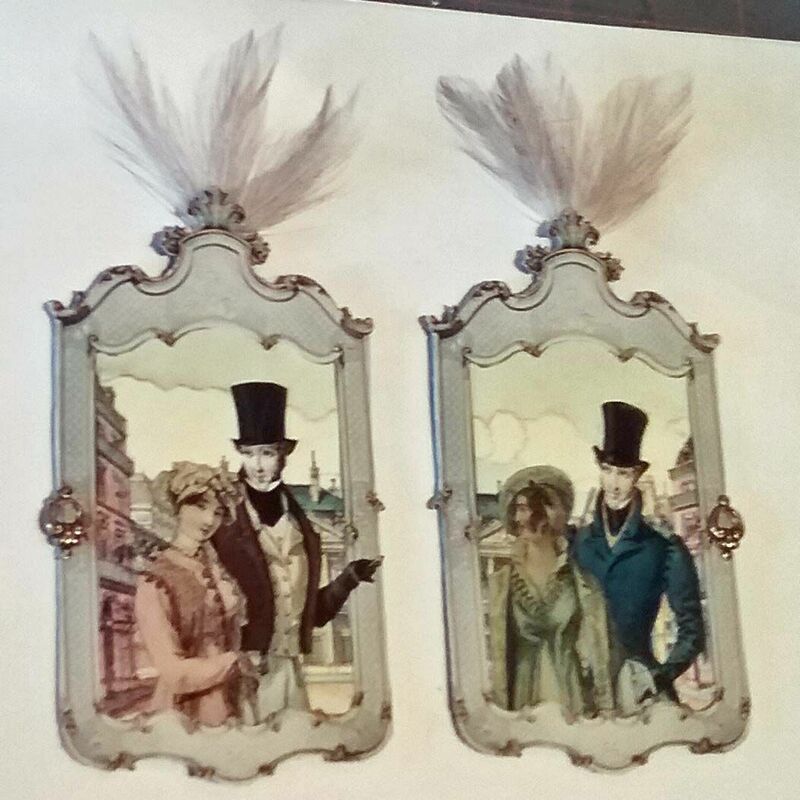 I backed the characters from the Mini Regency Fashion collage sheet with heavy cardstock. I attached the characters to the back of the shadowbox using popup dots. I used between 1 and 3 dots so that they would pop up at different distances from the background. 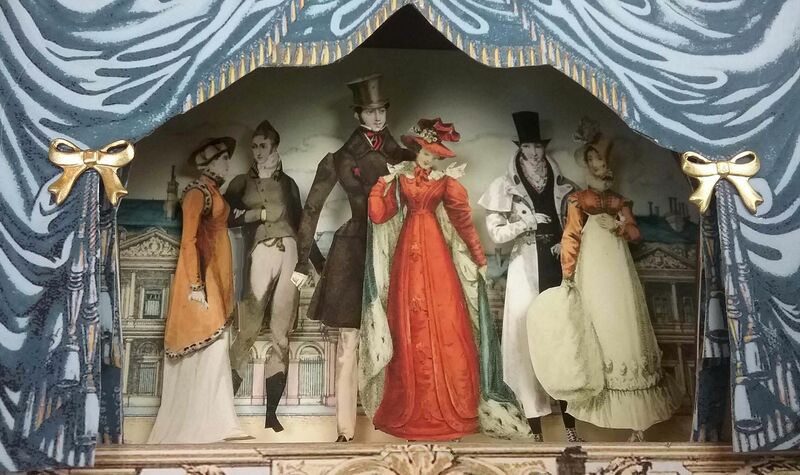 To create the theater façade, I started with a chipboard shadowbox facade. 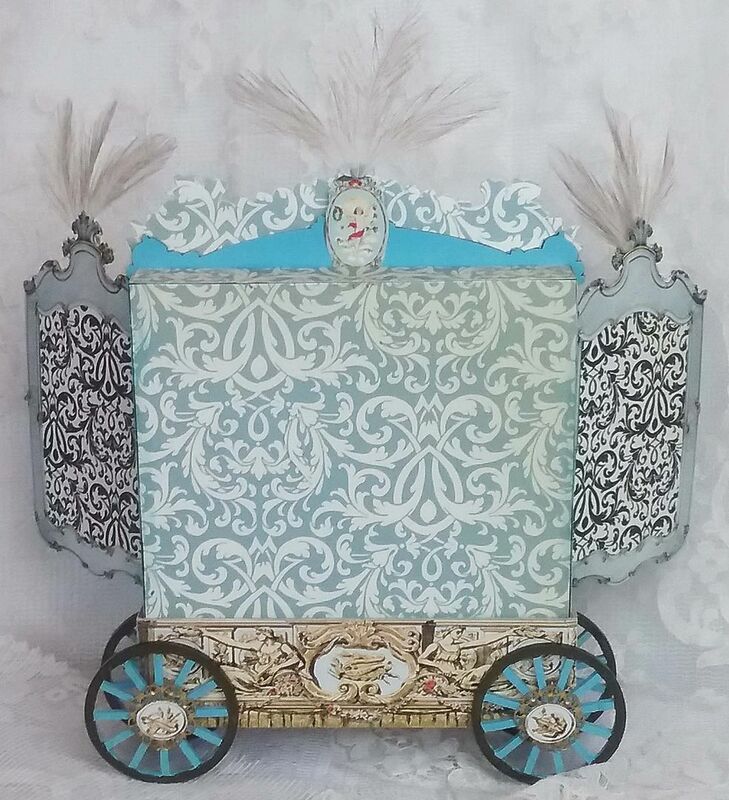 I used decorative paper for the top of the curtain and part of the curtain image from the Square Shadowbox Curtains – Teal Collage Sheet for the lower sides. 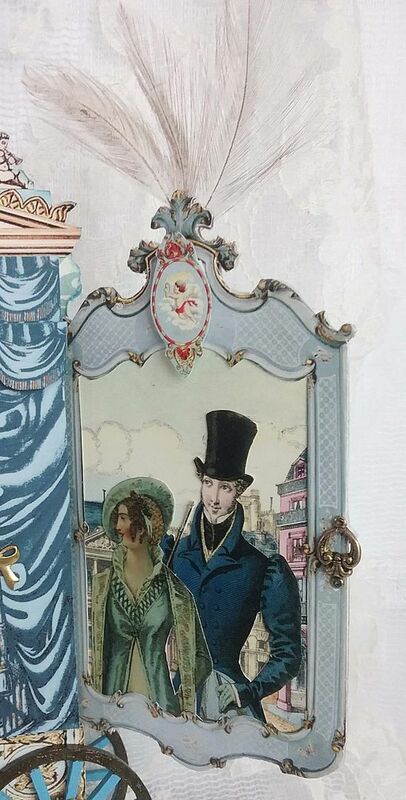 I added more of the teal curtain image to the chipboard facade and attached the chipboard to the front of the shadowbox. 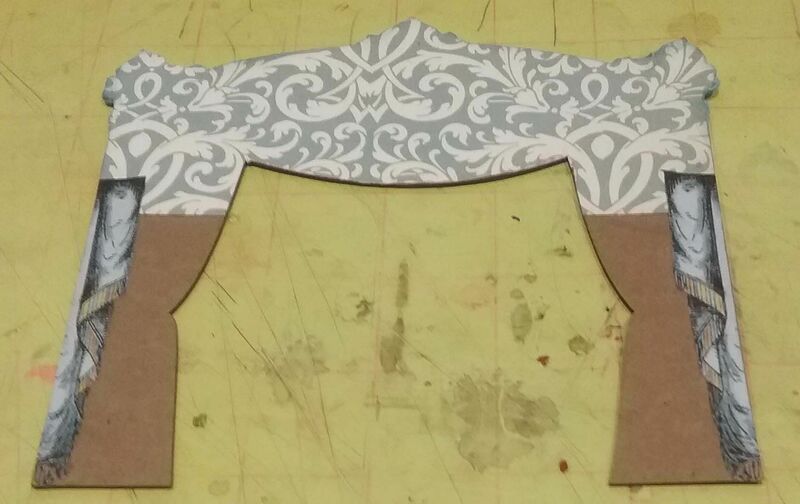 Next, I used images from the Gatefold Shrine Curtains collage sheet to create a skirt for the stage. I thought that the skirt gave the piece more height and provided a place to attach the wheels. 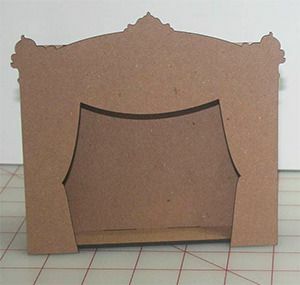 I backed the stage pieces with chipboard to make them sturdy. Next, I attached layers of teal curtains, popping up sections of the curtains to create dimension and added the chipboard skirt. 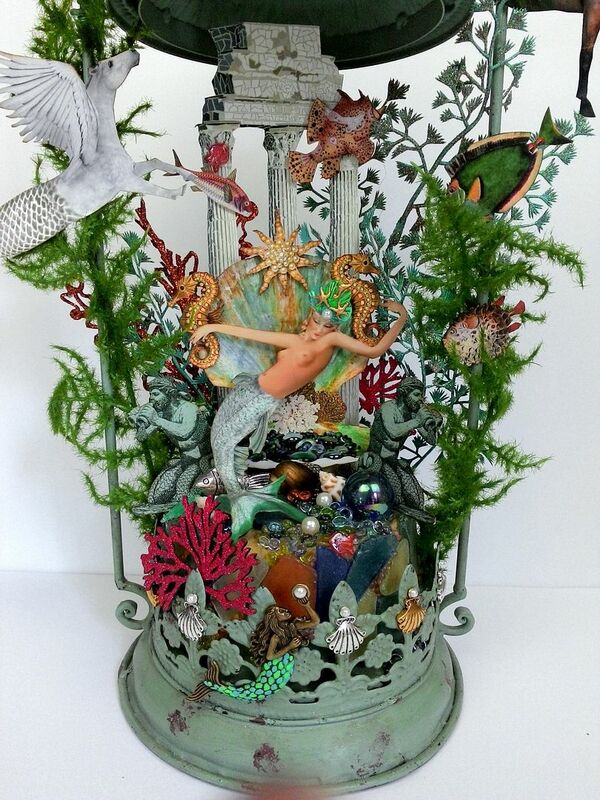 To the top, I added a pediment from the French Fairies Shadowbox Façade collage sheet backed with decorative paper. To dress-up the theatre I glued together 3 sets of white feathers colored with Inca Gold Gilders Paste. I used my fingers to apply the paste to the feathers. 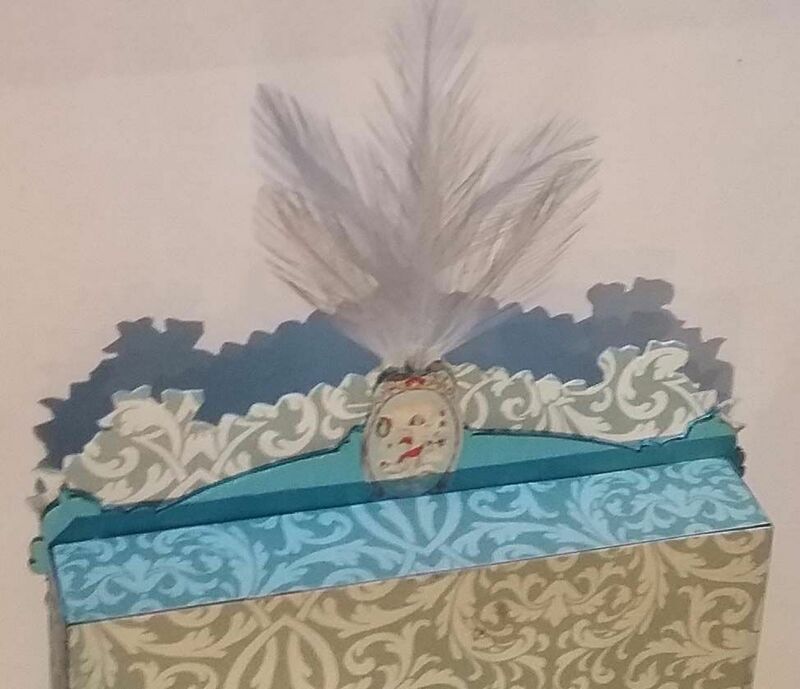 I attached one of the sets of feathers to the back of the pediment and used an image from the Gatefold Shrine Curtains collage sheet to cover the base of the feathers. 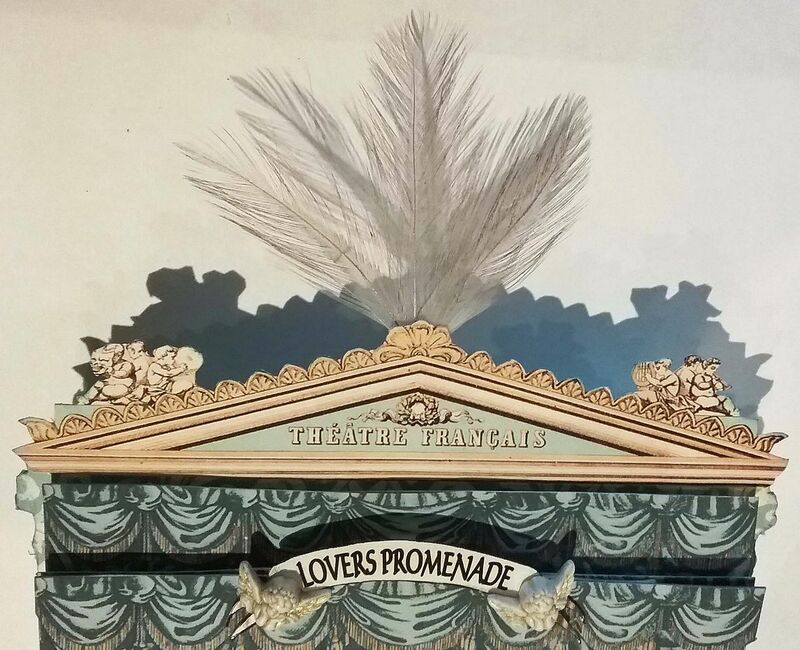 The “Lovers Promenade” sign is accented with cherub buttons. Next, I made the doors for the theater. 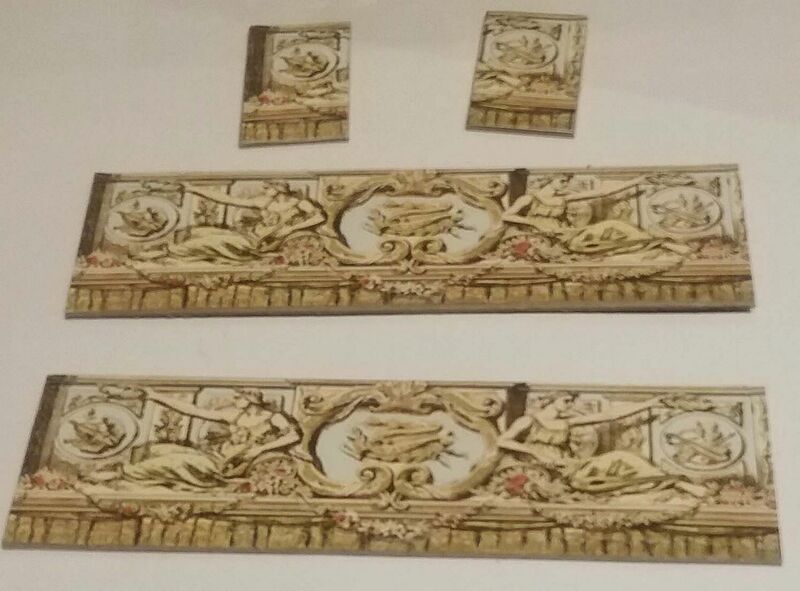 The door frame is from the Antique Frames digital image set. You’ll notice I used the same image in the background as I used for the background in the shadowbox. The couples on the doors are from Days Gone By collage sheet and/or the digital image set. I also attached feathers to the doors and a brass connectors to serve a faux pull (to close the doors). The picture below is a side view of the theater before the doors are attached. You can see how the pop dots on the curtains are visible. The doors not only serve as a structural and decorative element to the theater but they also hide the pop dots. 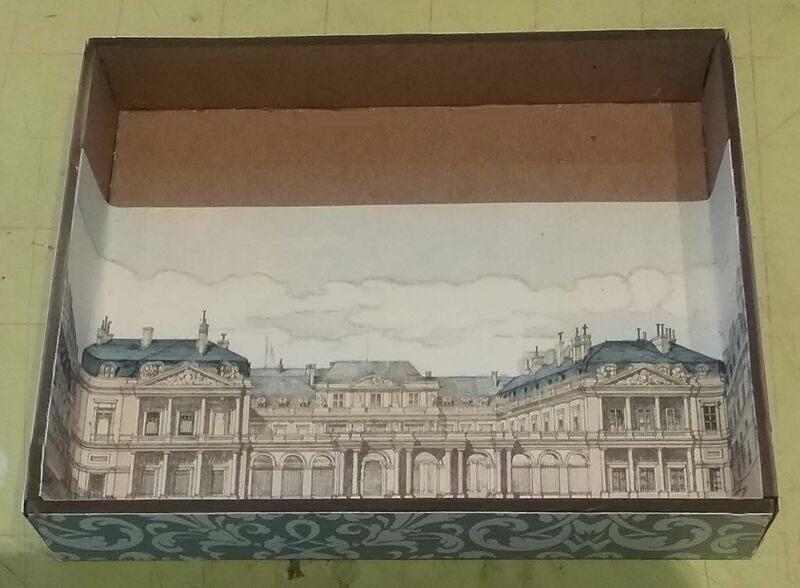 Next, I glued the doors to the shadowbox at a slight angle (forward). 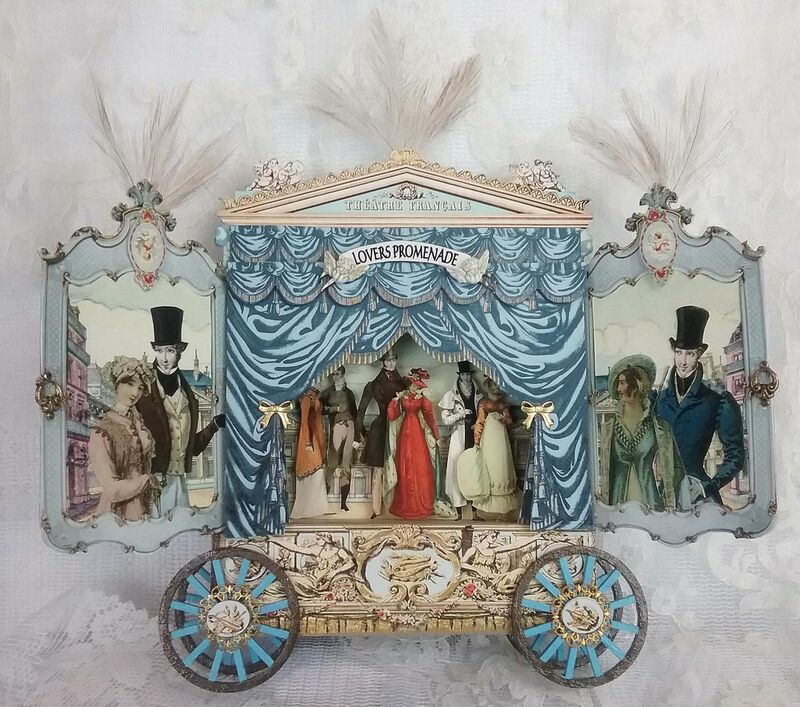 The last step was to add the chipboard wheels which I painted and then dressed them up with a piece of filigree and an image (the same image that is in the skirt). Lastly, I glued the wheels to the skirt. Days Gone By Collage Sheet or Digital Image Set – Man and woman used on the right side door can be found on the collage sheet or digital set. The man used on the left side door can be found in the digital set.